New functionalities for Availability & Blockout Days to allow for the further schedule customization. Renovations to the layout of Kalix. To start off, we have just launched a new update. The biggest changes were made to the Availability and Blockout Days pages. Along with a total page redesign, a number of enhanced features were added. 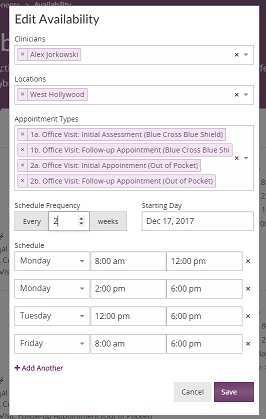 We have released new functionalities for the Availability & Blockout Days pages to allow for the further customization of your schedule. You can now set-up schedules with recurring frequencies other than weekly e.g. fortnightly, every four weeks. 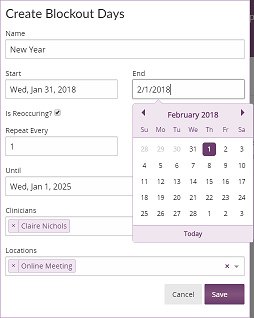 This improvement means that your online scheduler can be support appointment availability at different locations on alternating weeks, as well as more a more varied timetable. Blockout DaysBlockout days can be scheduled for specific clinicians and/or specific locations. Blockout days can also be recurring. These changes make it easier to schedule out specific clinicians vacations or make certain locations unavailable. As you may have noticed, over the past 6 months we have been slowly renovating the look and feel of Kalix. We will continue with these improvements into 2018. We are currently working on updating page layouts. As part of this most recent update, the new page design was initially implemented on the Availability and Blockout Day pages. Design improvements include easier to read page headers with a more prominent Help button, new date and time pickers, new multiple select fields and much more. All pages will be slowly updated throughout 2018. These changes will be gradual to ensure sustained product stability. Please forgive the design discrepancy for now. Updated doc layout: we have updated Kalix's default doc layout. Documents and templates exported to Word or PDF have a clearer look. Any customized doc layout will not be affected. 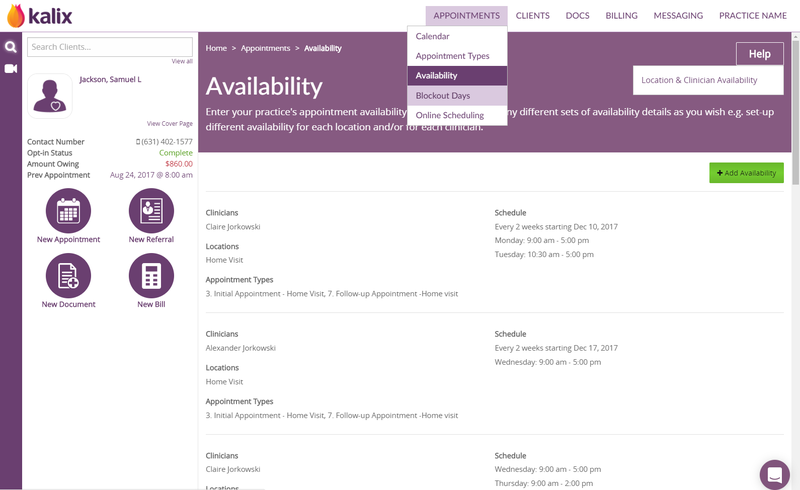 Online scheduling widget: on the final screen, Kalix nows shows the exact practitioner's name if "Any Provider" is selected. Inviting other users to your account: if you have previously trialled Kalix and your trial is expired, you are able to accept invitations to other Kalix accounts. Improvements to iPad: layout improvements to Kalix on the iPad including fixes to the scrolling issue on certain pages.